You learn to rise early on safari. As the persimmon glow of dawn turns to the lemon light heralding the full blaze of the rising African sun, your tent girl arrives bearing china pots of coffee and tea. She pads through the shimmering grasses of the camp and, with a gentle "good morning", leaves the tray on your camping table under the little veranda of your large tent. The coffee is strong, the tea benign, and crisp citrus biscuits jolt you into wakefulness. Within the hour, you're in the high open four-wheel drives on a game drive where you'll fulfil every great safari fantasy that ever was. It was on our flight into Maun in Botswana; we had our first eagle- high glimpse of the watery paradise of the Okavango Delta, a 6,950 square miles (18,000 square kilometres) Noah's Ark sheltering myriad animals. Maun is charmless, a dusty, spread-out town that serves as a staging and victualling post for the northern wildlife areas. You certainly won't want to stay there, but just outside the airport is a very good gift and curio shop, where you'll find beautiful baskets made by the local women from reeds and grasses. The shop also stocks a selection of pith helmets and khaki cotton shirts and pants if you want to play the role of an old Africa hand. From Maun, you climb into small planes resembling egg-beaters to fly off to your Delta camps. These planes are piloted by bushmen who are all macho chaps with crinkly eyes, enviable tans, and experience. Many of the pilots are Australian - very confidence - inspiring, as you wing out into the wide, blue skies above the channels and papyrus reeds of the Okavango. Ker & Downey has a small number of camps in the region: Kanana in the South-west Okavango, Shinde in the north and Okuti Camp on the banks of the Maunachira River, which flows through the Xakanaxa Lagoon within the Moremi Game reserve. In Moremi we saw our first lions, an elusive mating pair who played hide-and-seek with us through the trees and undergrowth, until madam, finally fed up with our efforts, turned snarling and threatening before melting into the shadows followed by her grunting maned lover. Here, we also saw our first waterbucks, with their white-circled, target-like backsides; elegant red, black and yellow-billed saddle-backed storks; blue-helmeted guinea fowl; giraffes; and many hippos, grazing in the evenings like a herd of bonsaied elephants. Coming home through the black night, our guide spotted a leopard, which we tracked for several kilometres, before he, too, disappeared magically. Unlike Kenya and Tanzania, where the game is spread out like a smorgasbord, in Botswana you have to find game - it's certainly all around you, but often camouflaged so cleverly you don't see it until you're on top of it. This adds the frisson of danger that game viewing is all about, and allows you to understand, perhaps, the mystique of hunting and the obsession of the nineteenth century adventurers who damned near wiped out these majestic animals. It is truly thrilling. Several days later, we moved on to Shinde camp in the watery north of the Delta itself, convinced nothing could top the variety of wildlife we had seen at Moremi game reserve and Chobe National Parks. We were wrong. 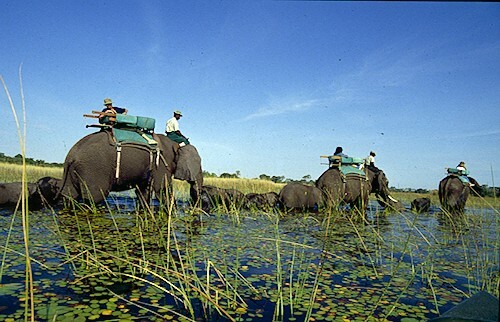 Shinde is on a palm island right on the waters of the Okavango. You arrive on a tiny strip that, before landing, has to be 'buzzed' to frighten off the herd of lechwe antelope that grazes on its grassy surface. You then transfer to speedboats for the hour-long journey through the channels to the camp. This jaunt is taken at breathtaking speed through a maze of papyrus-lined waterways, where crocodiles slip lazily into the waters beneath the mauve and cream lily pads. It's very hot, and long cotton pants are recommended for the boat rides if you don't want to get badly sunburnt. Mozzies are not a problem in the Delta, for the ecology here is so finely balanced that mosquito larvae are taken by their natural predators. We did, however, smother ourselves with insect repellent as a double deterrent. ... we treated the lions with a good deal of respect, before moving on to a hide where we spent a lazy afternoon watching the animals at a waterhole. Our first night at Shinde reverberated with the sound of lions, and the next morning we found them close to the camp. There were five of the great beasts, a male with such a fluffy mane he looked as though he had access to a blow-drier, and his four wives. The Shinde managers told us an epic and tragic lion tale. It seems that a former king of the lions had been murdered by a newcomer who had swum across the Delta to the island. Having dispatched the old man, the newcomer then set about murdering his progeny so that the new cubs would be of his line - the law of the jungle indeed. After that story we treated the lions with a good deal of respect, before moving on to a hide where we spent a lazy afternoon watching the animals at a waterhole. It was a busy meeting place - comical wart-hogs, their monstrous rhino-type heads belying comical back views (their tails stand upright when they run, like a taxi flag fall); many antelope; elephants; and stately storks and cranes who while away the heat-laden afternoon. Crimson bee-eaters, their mouths stuffed with dragonflies and cicadas, peppered a thorny acacia, while jackals skirted the waterhole, threading their way through the plovers and woolly-necked storks, the spur-winged geese and colourful hornbills. At Shinde, we had our greatest adventure, a blood-stirring encounter with two hippos, the species that kills more people than all the other beasts of the Dark Continent. We were threading our way through the hippo channels of the Okavango in a small mokoro, a splinter-sized native boat of the Delta, when we heard a gurgling and bubbling just to the left of us. "Stand up," said our boat boy. We did (no mean feat of balance in the tiny vessel), just in time to see the huge leviathan head of a hippo emerge from beneath the waters, just twenty metres from us, and closely followed by another. Mercifully, they paid us little attention. They have been known to actually bite the mokoros, which is why we'd been told to stand up, in case we had to bail out into the water. In truth, they looked rather like bridesmaids, swathed as they were in headdresses of the waterlilies they had surfaced through. Our next camp, Abu Camp, set in a pocket of hardwood trees in the heart of the Okavango Delta was named after a very special bull elephant, Abu, and was the original base camp when Africa's first elephant back safaris were pioneered in the Delta 17 years ago. Abu camp was home to Cathy, Bennie and Abu, three huge African elephants who had been rescued from dreadful lives in American circuses and zoos by a remarkable young man, Randall Jay Moore. He taught them to carry guests on safari, the first African elephants to do so. Abu became movie star, having had the honour of charging Clint Eastwood in the film 'White Hunter, Black Heart' (Clint's only comment as tonnes of pachyderm hurtled towards him was, "Hey, Randall, are you sure he stops on command?"). He also starred in the Power of One before retiring. Elephants aside, Abu camp is special with its long stretches of fishing along the Xhenega River, its birds and herds of giraffe that sauntered past while we lunched outside. It also has a resident school of hippo. They wander around the tents at night so if you come across one just allow him time to get out of the way, and don't panic. This too, is mokoro territory. We took an exhilarating ride up country where literally thousands of marabou storks make their nests. We sped through tangled channels where lechwe splashed through the shallows of the Delta in big herds. We saw crocs sunbaking on reed rafts, and became totally blasé about the great sheets of waterlilies festooning the shallows. The sunsets in the Okavango are mind-searing - vast rose and gold streaks settle into leachings of plum and crimson before the darkness finally settles, and it was in this hour that we came across a slaughtered baby hippo providing fine dining for seven hyenas and two monstrous crocodiles. On the flood plains of the Delta, one's normal Anglo-Saxon sensibilities are put on hold at sights like this. There is shock, of course, but there must also be an acknowledgment that the balance of nature here has continued unsullied throughout the centuries, a balance that brooks no interference from mesmerised travellers and contented tourists. If you are looking for the ultimate in privacy and luxury, Villa Okavango is situated across the lagoon, a five minute drive from the main at Abu Camp. This villa is perfect for families or four guests who want peace and quiet. The villa has its own private butler and private swimming pool.